Fresh fruits and vegetables actually don't necessarily cost more than burgers, fries and sodas. My Street Grocery from Dark Rye on Vimeo. Eating well is often a privilege reserved for people who can "afford" it, with the working class getting placed into a fast-food funnel. The only produce they can get is old, sold by convenience stores at a heavy markup. Meanwhile, chain restaurants in poor neighborhoods offer dubious deals where health suffers in the bargain. But fresh fruits and vegetables actually don't necessarily cost more than burgers, fries and sodas, so shopping for good, fresh produce shouldn't be an impossible achievement. That's the underlying philosophy behind My Street Grocery, an innovative food-truck program in Portland, Oregon, run by young entrepreneur Amelia Pape in partnership with Whole Foods Market. 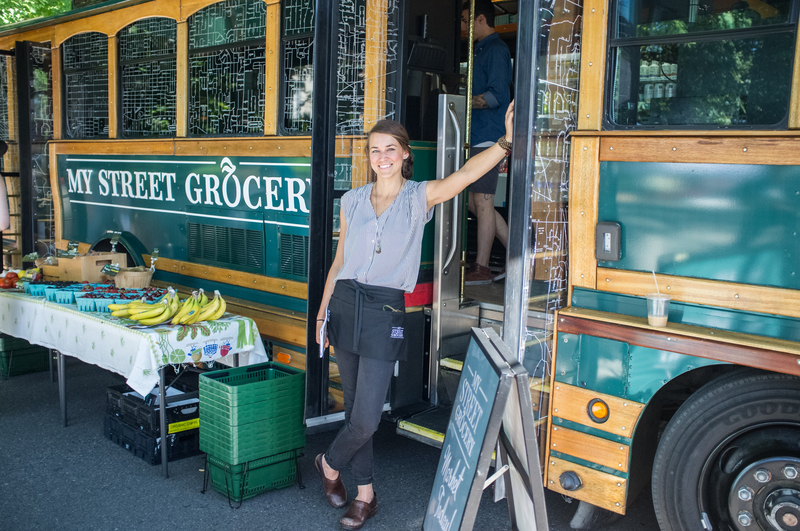 In her renovated trolley, Pape visits underserved communities in Portland, offering fresh fruits and vegetables, along with other grocery items. My Street Grocery focuses its attention on "food deserts," poor neighborhoods that often don't have a full-service grocery store, and certainly don't have health-food restaurants. More than 20 million Americans, even in progressive, relatively prosperous cities like Portland, live in these food deserts. They are Pape's clients. Businesses like My Street Grocery sometimes get tagged as upcharging their customers and exploiting a desperate base. But Pape, in a 2012 interview with Fast Company, said it's just the opposite. "We are very competitive with traditional grocery stores and much more affordable than the corner stores and fringe food outlets where many of our customers previously had to shop," she said. "Some people assume that because we're making it much faster and easier for people to shop, we impose some sort of 'convenience tax' as a consequence; this is just simply not the case." That's what My Street Grocery is doing in Portland and, hopefully, someday in other cities as well. This video shows how people living in underserved communities can enjoy healthful, affordable food, one meal at a time.